The websites creator or author is George Snell, American Web Systems. 2 links pointing to Cfagulfshore.org were found. Individual words like Show, Gulfshore and Region are frequently used in text links from other websites. The most important links to the website are from Catshows.us and Extracoeventscenter.com. 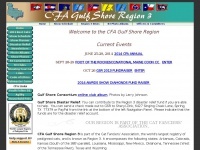 The homepage of Cfagulfshore.org and the subsite /showsched.php are most referenced by other websites. The table shows the most important links to Cfagulfshore.org. The table is sorted in descending order by importance. The table shows websites of Cfagulfshore.org, which are often linked by other websites and therefore they are classified as important content. A profile of Cfagulfshore.org was found on the social network Facebook. The web server used by Cfagulfshore.org is run by iWeb Technologies and is located in Montréal, Canada. This web server runs 5 other websites, their language is mostly english. A Apache server hosts the websites of Cfagulfshore.org. XHTML 1.0 Transitional is used as markup language on the webpages. To analyze the visitors, the websites uses the analysis software Google Analytics. Indexing the data of the website and following hyperlinks on it is explicitly allowed by robot information.